We have a lot of good things to say about a lot of good coolers. Let’s face it; there are dozens and dozens of manufacturers out there producing hundreds of different models of seriously good quality, high-performance coolers. Often times, differences between styles can be negligible. That being said, Orion Coolers has legitimately got to be one of our favorite brands out there. And that’s saying a lot coming from folks who, when it comes to coolers, have pretty much seen, tried, and tested everything. 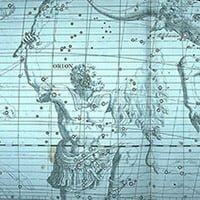 Orion, the ‘Great Hunter’ of Greek legend, was well known as a skilled hunter, master of beasts, and master of the seas. Like Orion the hunter, Orion Coolers exemplify strength, dominance, skill, and longevity. Orion, the Great Hunter of Greek legend. What Makes Orion Ice Chest Unique? Performance-wise, they’re unquestionably up there in that cream-of-the-crop category with the best in the biz. However, they won’t necessarily blow any other top brand out of the water. To us, rather, what really separates Orion from the crowd is the obvious passion and attention to detail that they put into their products and their company; from their absolutely A-grade website to their brilliantly thought-out and well-designed features, Orion is just a flat-out cool company that works their tails off to try and provide you with the best cooler out there. In this in-depth Orion Coolers review, we’ll talk about everything from sizes and colors, to construction, performance, and features. Like we said, performance-wise Orion ice chests won’t particularly blow a Yeti or a Grizzly or a Pelican out of the water, but size-for-size they’ll certainly do anything and everything that any of those brands will do – guaranteed. As far as ice-retention, like Orion says on their website it’s really tough to say or make a claim about any one particular brand, model, or size, given that there are so many variables that come into play: from the type of ice you use to the weather conditions to how many times the cooler is opened and closed, so on and so forth. Rest assured though – we’ll say it again – Orion will perform as well as any other manufacturer out there. They’re constructed with the same precision roto-molded techniques as all the other leading brands on the market. Actually, since we’re talking about construction, now would be a good time to mention that Orion ice chests are actually built by the same people that make Jackson Kayaks, for all you ‘yakkers’ out there (and also in case you were wondering what we meant about ‘Kayak Kings’ in the title. The production warehouses for the two companies are right next to each other at the manufacturing facility in Sparta, Tennessee – 100% USA made. The smallest size Orion 25 is the ultra-convenient, portable cooler that actually is designed to fit perfectly in the rear storage area of a Jackson Kayak. (The Orion 45 fits the Jackson Kayak SUPerFISHAL SUP). Thus, you’ve got every range of size covered whether you’re off on a quick grab-and-go day trip, or a week-long journey into the backcountry with plans of bringing home some serious poundage of fish or game. Our Editor’s Choice badge goes to 45 QT model, Blaze. Why so? We’ve found it the most convenient amongst all: it’s not too big, not too small, it’s easy to carry and looking really good in Blaze color. Now, this next part may sound a bit silly, but we’ve got to admit that one of our favorite things about Orion coolers are the colors they offer. They’ve just introduced their new for 2016 standard color, Stone Cold, to go along with their other options; Forest, Sky, Dorado, Jungle, Bluefin and Blaze. All colors are ‘splashed’ camo variants – super unique and bound to earn some comments from your (jealous) friends. It’s also worth to mention that Orion launched a special Home Team Series: traditionally colored coolers, with many different color options too choose from. 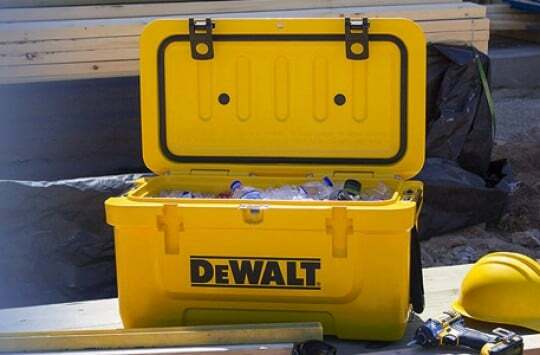 They’re “tailgate-friendly” ice chests, featuring little nice add-ons such as the bottle opener or locking corners. As for colors, Navy • Red • White is just one possibility, our personal favorite. 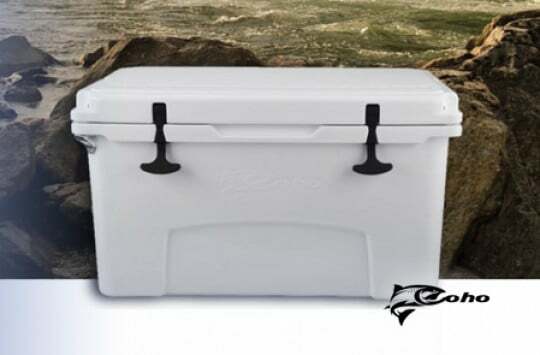 Each size cooler comes with super high-quality aluminum bottle openers on all four corners (3), that also act as tie-down points and bumper guards to minimize wear and tear. (Speaking of tie-down points, there are two additional spots on each side for tie-down straps, giving you six different spots total to latch the cooler down securely (2)). Some other additional standard features include: a non-skid standing pad (1); ‘motorcycle grip’ carrying handles (6); 2” of ‘Best in Class’ insulation (7); lockable, certified bear-resistant, low-profile latches (5); drain plug (9), and YakAttack/RAM integration tracks (10, more about it below). We say standard features because they actually come standard with the cooler – not as some gimmicky ‘optional’ feature that’ll cost you an extra hundred bucks). Ok, then, we’ve saved our favorite feature for last; the built-in YakAttack tracks and RAM integration. These are built in tracks on each side of the cooler where you can mount just about anything you could want to or think of mounting; your cell phone, cup holder, rod holder, gps mount, floodlight, Go-Pro, etc. Considering how many people out there love documenting their outdoor experiences on Go-Pros and/or super high-quality cell phones, this is a brilliant idea. 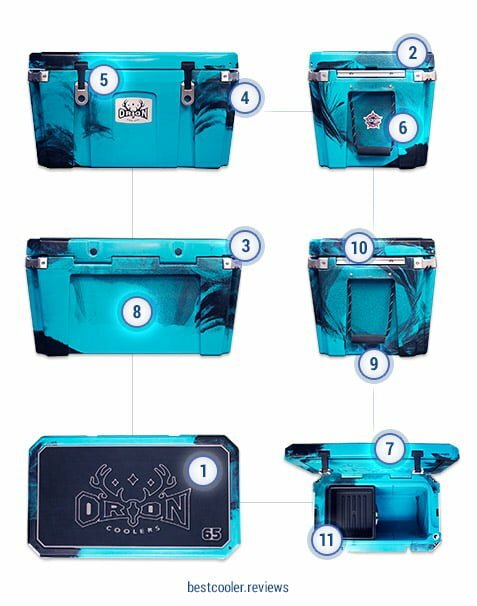 Plus, it gives you some seriously added convenience and the ability to legitimately trick out your cooler in dozens of different ways. Thinking of attaching your handheld electronics, phone holder, camera mount? If so, then this is for you. Allows quick and easy attachment point to the YakAttack GearTrac. RAM cell phone holder accessory, mounts to 1″ Screwball. Grips most styles of cell phones. RAM-ROD fishing rod holder with a 1.5″ Screwball. Can accommodate most styles of rods. RAMs cup holder/koozie/arm combo, with a 1″ Screwball. 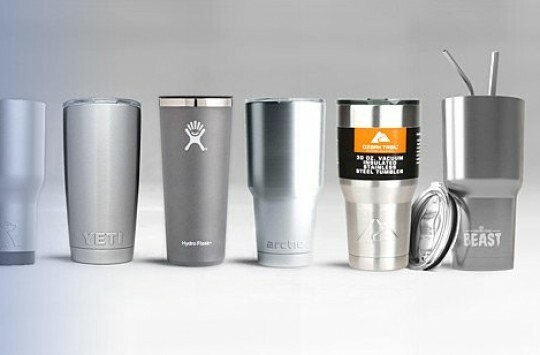 Keep your beverage cold, level, and accessible when you need it. Our recommendation for simple and secure online purchasing is through Amazon.com. They carry the full range of sizes, colors, and Orion accessories so it’s a convenient one-stop shop for buying Orion gear. Also, check out Orion’s dealers page for a list of retail locations nearest you, if you like doing your shopping in-person. The bottom line is Orion is one legit brand. Building off the massive success they’ve had with Jackson Kayaks, they’ve taken their rotomolding equipment and skills that they’ve perfected over the years, and designed some seriously top-notch coolers. Ok – this, this, and this should be different … let’s just go and make our own cooler, and we’ll make it better than all of these. And that’s what they did – thus the birth of Orion coolers.